Last Saturday I got invited to visit the Beyond El Dorado: power and gold in ancient Colombia exhibition at the British Museum. I’ve always been intrigued by ancient cultures and myths, so obviously I was up for finding out more the legends behind El Dorado. I have to admit, I didn’t really know much about that area beforehand, and had kind of assumed it was related to the Inca empire (which it actually isn’t). 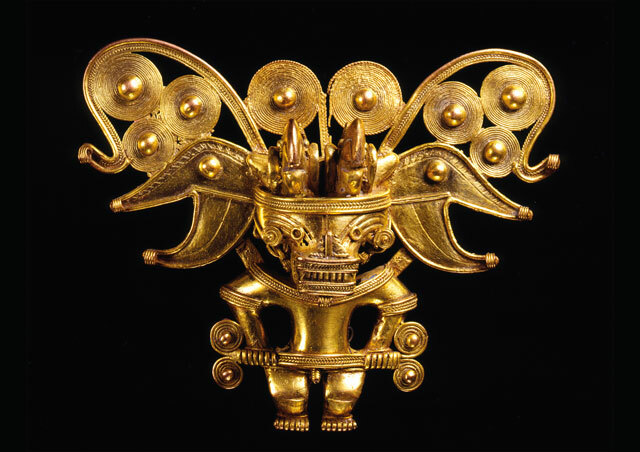 The exhibition features over 300 objects from the collections in the British Museum and Museo del Oreo (literally the “Gold Museum”, located in Bogota, Columbia), showing the technologically advanced gold working craftsmanship of the different cultures of ancient Colombia. It was really interesting discovering more about the creation and the meaning of all those objects. Plus some of the gold metalworking is exquisite! So much detail and precision in such tiny objects; it’s gorgeous to see. There are still tickets available if you want to see the exhibition yourself, but hurry! This Sunday is the final day of the exhibition. Disclaimer: tickets to the Beyond El Dorado: power and gold in ancient Colombia were provided by American Airlines.